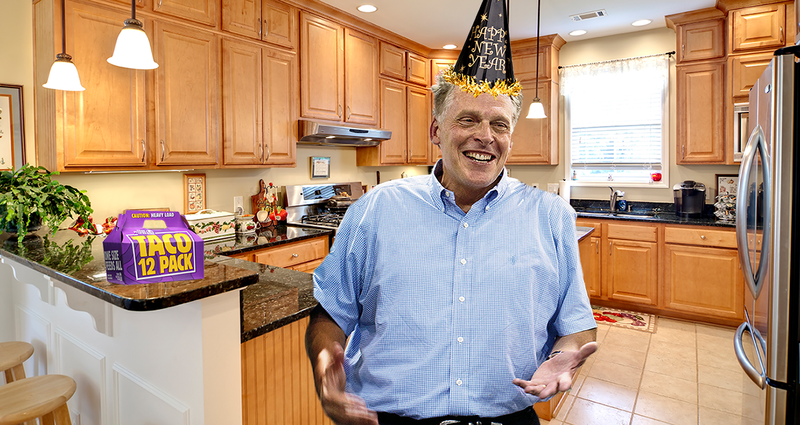 RICHMOND, Va. — Having had enough of keg stands and dancing, Terry McAuliffe finally decided to head home yesterday after enjoying New Years Eve festivities at the Executive Mansion. McAuliffe attended the informal soiree with his wife Dorothy at Governor Northam’s invitation and reportedly had a fantastic time. The party began to wind down shortly after 12:30 a.m. on New Year’s Day. Yet, as guests departed, McAuliffe found a 1990s hip hop Pandora station and began to dance to OutKast’s “Players Ball.” He then told his wife he would see her at home later. Northam alerted his security detail of McAuliffe’s presence and asked that they make sure he got a safe ride home when he was ready. Northam awoke the next morning to find Terry still drinking and dancing. Citing the need to return to the business running the Commonwealth, Northam and his staff managed to coax Terry to into the fenced backyard using a trail of jello shots. They then carried the remaining kegs and party supplies out to the patio and locked the door. Executive mansion staff reported that McAuliffe remained on the property for days playing solo games of beer pong and dancing with a statue of Patrick Henry. Throughout the ordeal, McAuliffe reportedly maintained a peak level of intoxication, never sleeping or passing out. Executive mansion staff made several attempts to ask McAuliffe to leave but instead ended up watching the former governor sing Flo Rida’s “Low” and take tequila shots. Did you pick up a t-shirt from our online store for NYE? If not, you can still get one now. No worries.